While Shanghai doesn't pop out as a city famous for its temples, there are a number of interesting monasteries and temples to visit in Shanghai and they make a nice quiet stop within a harried day of shopping and sightseeing. It's easy to spend an hour wandering around any of these places and while not very busy outside of local festival days and Chinese New Year, you'll get a sense of Chinese religious practices. 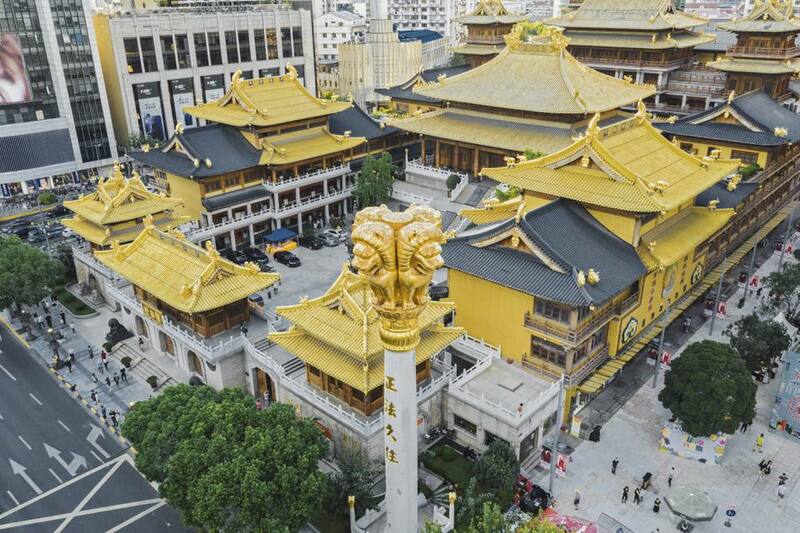 While slightly less famous than the Jade Buddha Temple, Longhua is the oldest and largest Buddhist temple in Shanghai. The monastery is said to have been founded in the 3rd century, while the 7-story pagoda (not open to visitors) dates from the 10th century. Visit during the Longhua Temple Fair when hundreds of stalls selling traditional Chinese food and trinkets are set up. The temple is located on a small pedestrian street so your taxi driver might stop and just jerk a finger in the direction of this sedate temple. The street vendors outside selling everything from giant stuffed animals to squid-on-a-stick offers an interesting juxtaposition to the refined gardens and quiet temple complex. The Jade Buddha Temple is probably the most famous temple in Shanghai and will be printed on every hotel card destination listing. While the complex is small, it is interesting to wander through and has a number of halls to stop and peek in: Hall of Heavenly Kings, Great Treasure Hall, and 10,000 Buddhas Hall. The centerpiece is, of course, the Jade Buddha located in its own hall (extra 10rmb entry) at the back of the complex. Totter up the well-worn stairs to have a look at the nearly 5 foot (1.9m) tall pale-green Burmese jade likeness. All Chinese towns traditionally had a Daoist temple dedicated to the town god. Shanghai's dates from 1403, though the current building site is new, constructed in the 1990s. The town god, the Míng Dynasty emperor Hóngwu's likeness is in the rear hall.